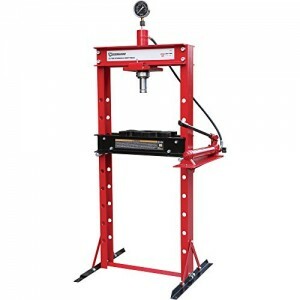 The Dake F-10 model manual utility hydraulic floor press uses a single-speed hydraulic handpump to lower the ram with up to 10 tons of force to facilitate pressing and forming. 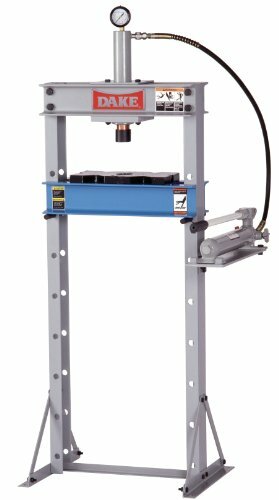 The channel iron H-frame accepts large and bulky items, and the hoist adjusts the table height for proper positioning. 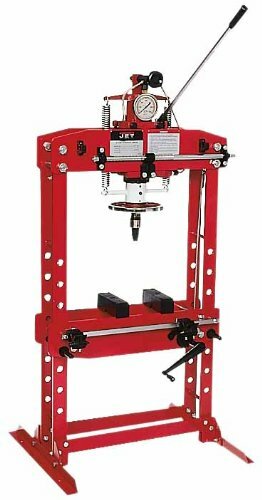 The workhead is movable to adjustment for off-center pressing. 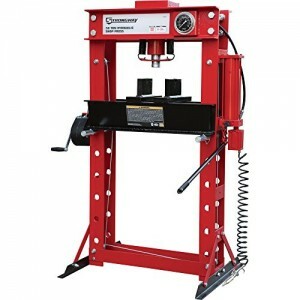 The hydraulic cylinder and pump handle can be positioned on either side of the press to maximize workspace and comfort. The release valve turns to release the hydraulic pressure, initiating ram return after downstroke. Closing the valve at any point during the ram return will halt the ram. Two interchangeable ram noses are included: a flat nose piece for use in standard pressing operations, and a step-reduced nose piece for supporting, positioning, or fitting into pieces when pressing. The two table plates provide support during pressing. The press has a gauge with a 2-1/2″-dia. display for pressure readings. The base has four 7/16″-dia. holes for floor mounting. Mounting hardware is not included. Hydraulic oil is not included. Press requires some assembly.